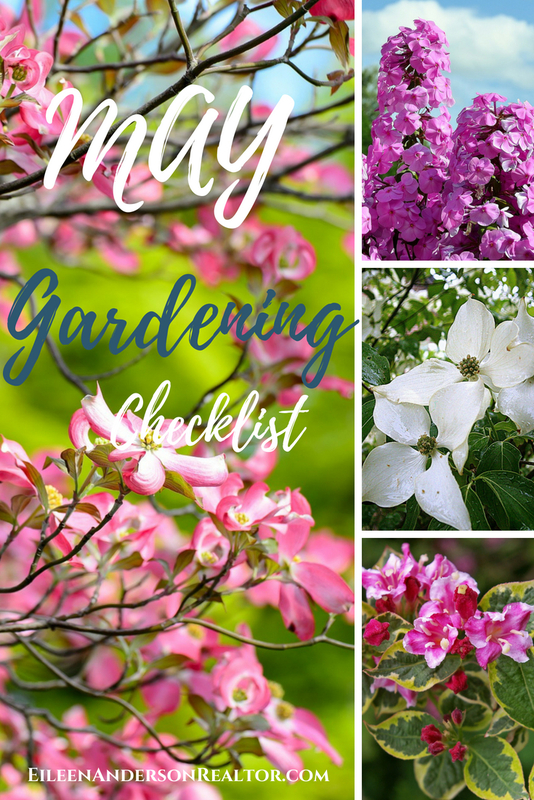 May is the time to select your flowering perennials to have a progression of bloom from spring to fall. Transplant ground-covers including English Ivy, Myrtle, Lily of the Valley, Pachysandra & Ajuga. Stake elongating stalks of Peonies in early May to prevent “flopping” – use special peony rings. Leave in place until the stalks are cut to the ground in late September. Remove spent blossoms from tulips, daffodils & other bulbs, but let foliage wither & turn yellow before you remove it to replenish the bulb’s food supply for next year. Apply Rose fertilizer (Rosetone) now – rich in organics, to promote vigorous growth & beautiful blooms. Make successive plantings of carrots, beets, radishes, chard & leaf lettuce. Since phosphorous moves very slowly in the soil, fertilizers with this nutrient are best scratched into the root zone. Wash insect-infested herb plants with a mild soap solution, then rinse with clear water. Select early, mid-season & late cultivars of Blueberries for a long picking season. May is for Mother’s Day! 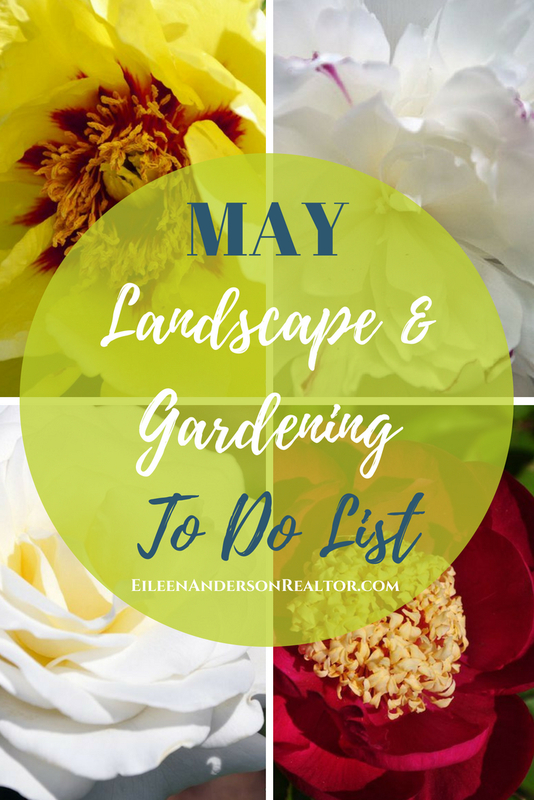 Remember Mom with a flowering plant OR LEAVE HER ALONE ALL DAY SO SHE CAN GARDEN! Make first planting of sweet corn & green beans. Plant Dahlias in sunny, well-drained, fertile soil after the ground is warm. Set aside a small plot near the back door as a “snack” garden. Enjoy herbs, berries & veggies. Hedges of boxwood, privet, barberry & yew can be sheared or trimmed as often as needed through the summer to keep their shape. Keep the base wider than the top. Finger-prune the “candles” of mugho pine, pinching them back most of the way to force internal growth rather than leggy growth beyond the plant’s present height & width. Tent caterpillars have exited their egg clusters & constructed silken tents in the crotches of trees. They won’t venture far beyond the tent for the next few weeks, but by late May they will start devouring foliage day & night. If possible, poke a hole in the tent & direct a stream of water into the tent to break it apart & knock it to the ground. Then sprinkle limestone over the wiggling caterpillars to immobilize them, causing them to die in a matter of hours. Protect honeybees! Never apply insecticides to fruit trees in bloom. Want privacy? Plant a hedge of Arborvitae, Hemlock, White Pine, upright Junipers. Grubs have entered a month-long resting phase after which the emerge as flying Japanese beetles. If you choose to treat for these May is the time! Spot treat broad-leaf weeds with an appropriate herbicide if weeds are not widespread throughout your lawn. If you are feeling ambitious and want to add some hardscape to your property here is an easy weekend project: How to build a stone wall from start to finish with no steps skipped! See the beautiful shade garden you can add to the stone wall! 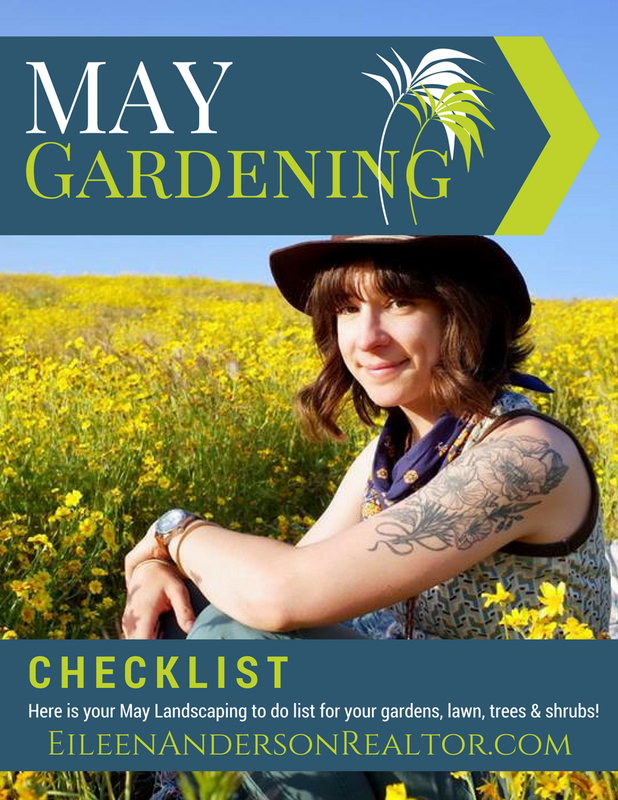 Looking for some gardening ideas? 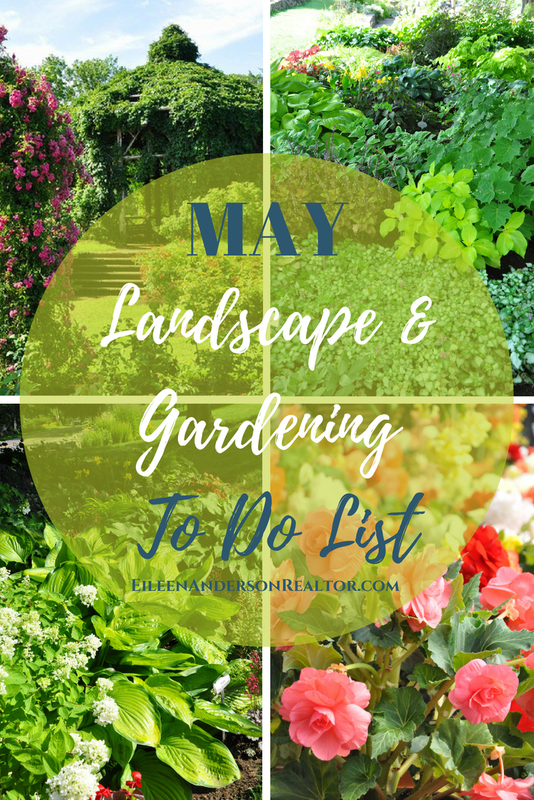 Check out the garden tour photos from last year! Thinking of selling your home? Don’t make these common mistakes when selling your home! I enjoy helping home buyers find the home of their dreams or helping sellers get their home ready for a smooth sale. See all the great things to do in the state of Connecticut! I am licensed for residential real estate sales in the state of Connecticut including but not limited to the following CT towns: Avon, Bloomfield, Burlington, Barkhamsted, Bristol, Canton, Colebrook, Granby, East Granby, Hartland, Hartford, Suffield, Windsor, New Hartford, North Granby, Farmington, Newington, Litchfield, Simsbury, Suffield, Old Lyme and West Hartford, CT.